Winner of the COVR 2000 Visionary Award!!!! Embracing Menopause is a special gift to women in transition! Join acclaimed yoga teacher Susan Winter Ward in a soothing yoga class designed to naturally ease the process of menopause. 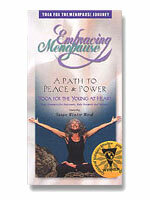 Relax,reassess and honor the “wise woman” that is emerging within you. Connect with your peace and power as you move through your sacred rite of passage.